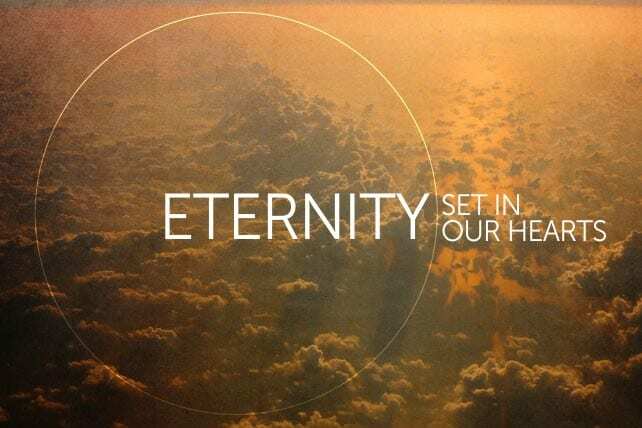 This corresponds with what Ecclesiastes 3:11 tells us: that God “has also set eternity in the human heart.” Look around you at all those people walking the streets, working in offices, standing in lines, sitting in restaurants. Their eyes are filled with needs, hopes, longings. The world tells them they’re just molecules and DNA, time plus chance. But their hearts cry out for eternal realities, for what will last, what really matters. And they’re absolutely right. Something is missing. The first thing missing is the person we were made for—Jesus. Haggai 2:7 refers to Messiah as “the desired of all nations,” the Person that all people of all cultures long for. But there’s something else missing. Every human heart yearns not only for a person, but a place. The place we were made for. The place made for us. In Revelation 7:12, Jesus makes a great promise to those who obey him: “I will write on him the name of my God and the name of the city of my God, the New Jerusalem which is coming down out of heaven from God, and I will also write on him my new name.” Jesus says he will put on us the name of the person and the name of the place (heaven) for which we were made. We spend our lives longing for this person and this place. Just as people restlessly move from relationship to relationship seeking the person they were made for, they move from location to location seeking the place they were made for. Somewhere new and better. A bigger house. A different city. The suburbs. A new neighborhood—safer, nicer, with better schools. That dream house in the country. That idyllic mountain chalet. That perfect beach cottage. People are made for the eternal and therefore cannot be ultimately satisfied by the temporal. We long for a future world of justice, purity and joy—and a King who will bring all of those. We therefore cannot be happy with the present world of injustice, impurity and suffering. True joy comes in anticipating, and living now in light of, the world yet to come and that world’s King, who made us for Himself. Previous articleIs Great Preaching Killing Discipleship? Randy Alcorn is the founder and director of Eternal Perspective Ministries (www.epm.org), a nonprofit ministry dedicated to teaching principles of God’s Word and assisting the church in ministering to the unreached, unfed, unborn, uneducated, unreconciled, and unsupported people around the world. Before starting EPM in 1990, Randy served as a pastor for fourteen years. He is a New York Times best-selling author of over fifty books, including Heaven (over one million sold), The Treasure Principle (over two million sold), If God Is Good, Happiness, and the award-winning novel Safely Home. His books sold exceed ten million copies and have been translated into over seventy languages.